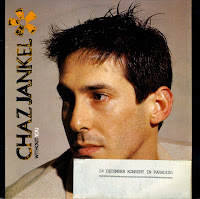 'Without you' was a single by Chaz Jankel released in 1982. I never heard the track back then, which is not surprising since it didn't chart. Still, it is quite a great song, in the mould of other Chaz Jankel tracks. As an added bonus, the B-side is a dub version of his earlier single 'Questionnaire'. What's funny about this single (and two others I bought the same day) is that it comes from the stock of Disco Market, the shop where I bought loads of singles between 1975 and 2002. I recognized it from the '1' written on the right hand corner on the back of the sleeve - indicating that this single once cost 1 guilder.